In its first public reaction to the Internet row between Google and the Chinese government, Beijing today reasserted its right to control the Internet and strengthen what it calls "Internet management." China's position, which comes amid attempts by many authoritarian regimes to control the web, has led some commentators to question whether a new trend toward local or state control over the Internet is developing. Experts say the case, where Google has threatened to shut down its operations in China because of government censorship and cyberattacks against rights activists, reflects the clash between local or national interests and the forces of globalization. Silvio Waisbord, an expert on media and globalization and the director of graduate studies at George Washington University, says we are witnessing "another round of a very long battle between the forces of globalization -- media globalization -- and one of the few governments [China] that actually has tremendous political and economic power to stand up to the demands of those interests." "This is not a new battle that Google is having in China, and I'm sure this is not going to be the last battle of this struggle," he says. "Regardless of how this issue actually gets solved, I think that [battle] is going to continue." Waisbord says that the dispute -- as well as attempts by authoritarian regimes in other countries like Iran -- fall within existing theories about the role of information technology and globalization. "The Google case actually shows what we knew 10 or 15 years ago," he says. "There is no assured process in which everything becomes global. Local forces, because of governments or the [local] economic interests, are always at play." Still, within the existing economic theories on globalization, Waisbord says the Google-China dispute is a new kind of test case. "It is a test case because it is highly unusual that a corporation the size of Google, especially with the dominance it has in the industry, is willing to play hard politics with the Chinese government," Waisbord says. "Google is in a very difficult position between the economic interest of having access to what soon will become the largest market of Internet users and the political pressures -- and how it can stand for the defense of basic freedom rights, information rights, in light of the restrictions and the pressures coming from China." Chinese Foreign Ministry spokeswoman Jiang Yu claims that China's Internet is "open" and that the government encourages what she called "the healthy development of the Internet" to create a positive environment. "Like other countries, China controls the Internet according to law," Jiang said. "Our relevant management measures are in line with common international practice. I also want to stress that China welcomes international Internet businesses developing services in China according to the law." In fact, Internet users in China face tighter controls and surveillance than in almost any other country. Beijing has created a vast system of Internet censorship that is known informally as the "Great Firewall of China." Government censors constantly surf the Internet looking for material that they deem to be "unhealthy" and block access to it for users within China. 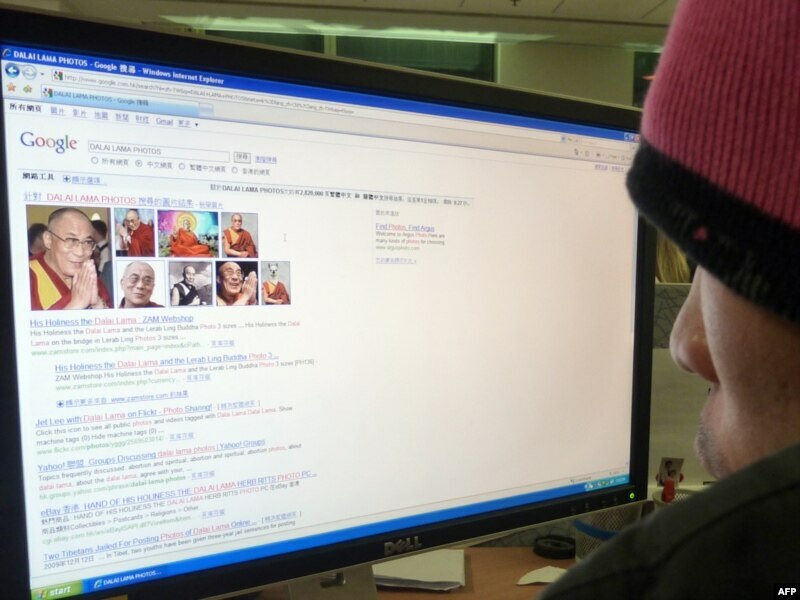 Most often, the government censors block politically sensitive information -- for example, reports on the activities of the exiled Tibetan leader, the Dalai Lama, or documentation of the military's bloody 1989 crackdown against pro-democracy demonstrators in Tiananmen Square. Last year, the Chinese government shut down tens of thousands of websites and had thousands of people arrested in connection with what Beijing described as an "antipornography drive." Is this the beginning of a new era of censorship? The government also blocked social-networking sites -- including Google's video-sharing site YouTube in March and Twitter and Facebook in July -- in a bid to stop the spread of information about political unrest. Only a few Internet users in China can gain access to such sites by using proxy servers. Most in China cannot get access at all. In far-western Xinjiang Province, where nearly 200 people were killed last year in some of China's worst ethnic violence in decades, the Internet was simply shut off. Limited service was only restored at the end of 2009. Bill Echikson, a spokesman for Google, tells RFE/RL that his firm was wary about self-censorship agreements it had to make with authorities in China in order to be allowed to operate in the country at all. "When we launched our service in China four years ago, we did so because we believed that the benefits of increased access to information for the people of China outweighed the discomfort in agreeing to filter the search results," Echikson says. "What we've discovered is that these attacks [against human rights activists and foreign companies] and the surveillance -- as well as the attempts over the past year to limit free speech on the web -- that has led us to conclude that we are no longer comfortable self-censoring [Internet search] results in China." Echikson says Google now worries about the safety of its employees in China. He says that if Beijing doesn't change its policies on information control, the company will shut down "google.cn," its Chinese-language search engine in the country. "We will be talking to the Chinese authorities about the possibility of operating an uncensored search service within China," Echikson says. "We are hoping to be able to operate securely in China and in a way that increases access to information to our users in China. If it is impossible, though, to operate such an uncensored service within the law, we will close google.cn." Kaiser Kuo, a commentator on China's Internet and former director of digital strategy at public relations firm Ogilvy China, says he thinks Google would sacrifice quite a bit -- access to the world's largest Internet market -- if it shuts itself off to future participation in China. "China does not want to appear to be a bully vis-a-vis American companies operating here. It certainly doesn't want to scare off companies. It prides itself very much on the openness of its market, its ability to attract foreign direct investment," he says. "There are an awful lot of American companies operating in China, and to lose Google, which is such an iconic company, would really be egg on its face." That is a risk Beijing appears willing to take in order to stave off public criticism of the government and political system within China. Minister Wang Chen of the Beijing State Council Information Office said today that Internet companies should help China's one-party government steer developments in a fast-changing society. Wang said China is at a "crucial stage of reform and development" that is "marked by social conflicts." Those remarks recall a decades-old hypothesis on censorship by the late Frederick Siebert -- a professor of journalism history at the University of Illinois. After examining the history of censorship by the English government and the advancement of free speech, Siebert concluded that "freedom contracts and the enforcement of restraints increases" as stresses on the stability of the government and the structure of society increase.